As far as life is concerned there is only one thing that is certain. This is especially true with divorce. Going through a divorce is difficult and many men have a hard time transitioning to this new reality. Recently I was asked how a divorced man can reclaim his identity concerning his personal style. Specifically – he had stopped caring and found himself thrust into the world without a clue as to how he should be presenting himself as a newly single man whose youth is behind him. How does a divorced man reclaim his personal style and improve his confidence? With some upfront work it’s actually easier than you think. 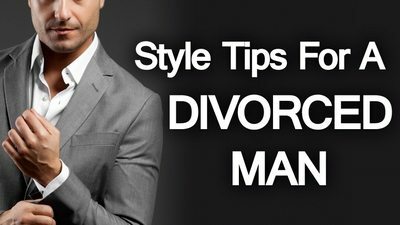 In this article I am going to highlight 4 key tips to dress better and improve your confidencespecifically for the divorced man. I am positive that these 4 tips will help you re-discover your personal style and reclaim the confidence you had before divorce. Before doing anything else, the divorced man should take some time, grab a pen and paper and write out some goals for himself. This is very helpful in many ways. Gain Some Purpose – Having a purpose is a great tool for self motivation. If you are looking to improve your style, really try and answer the question of why this is important to you and how it will make you feel when you achieve this goal? Set a Clear Direction – Tying your emotion to a specific goal gives your life some direction. It is easy to try aimlessly to improve yourself but that chances for success is exemplified when you have a direction in place. Avoid Superficial Feelings – Improving your style for the wrong reasons may sound decent at first thought but may look silly when writing them down on paper. Really ensuring your emotional goals are inline with your lifestyle and what you truly believe in will make it that much more motivating to achieve. Having a few clear emotional goals for your self is the stepping stone to self improvement. I cannot stress enough the importance of continuous learning for your overall development. If your main focus is to dress better, buy some books on the topic and become a menswear expert yourself. Most men do not take the time to learn about their passions so you will be creating a pretty big competitive advantage for yourself. To further expand on this, you should also gain some inspiration from some thought leaders and experts already in the field you are interested in. It is important to have someone to look up to and learn from. As a result, you will be learning from someone who walked through a similar path as yourself and has already made the mistakes along the way (and learned from them!). Picking yourself up after something big such as a divorce is not easy but educating yourself consistently will help you improved on all levels while giving your confidence a boost. Once you have some goals setup and have begun the process of educating yourself, you should then look for ways to hold yourself accountable. Have an Accountability Buddy – Nothing will keep you on track with your goals quite like having a friend or relative keep tabs on you and offer encouragement throughout the journey. You can schedule quick weekly calls or meet up for coffee to give a status of how far along you are in the process. Another option is to use an online accountability service – I created one here! Broadcast on Social Media – With technology at our fingertips, we now have the ability to generate an audience. Most of the time this is just family and friends but still a great incentive to have your goals completed on time. Nothing will get you moving faster knowing that literally the world is able to see that you did not meet your goals. Use this pressure as positive reinforcement. Own The Goal – Having a goal that is created specifically for you is more exiting and easier to want to take responsibility in its completion. You will notice that you want to train hard to complete that marathon or dress well on presentation day more if you know it was a goal you specifically set out to achieve. I call this tip the boomerang effect. Give compliments to others, and people tend to give compliments back. Not only will this facilitate stronger social and professional relationships but you will also slowly but surely increase your confidence levels. Many times after a divorce, men have to start from scratch as far as building their social life is concerned so this step should be taken seriously. Fostering new friendships and building your social circle will open up many opportunities in your professional and personal life that’s just not possible on your own. In Conclusion – Follow these 4 tips and you’re on your way to rebuilding your style & confidence after a divorce. Click here to discover how to speak with confidence as a man.